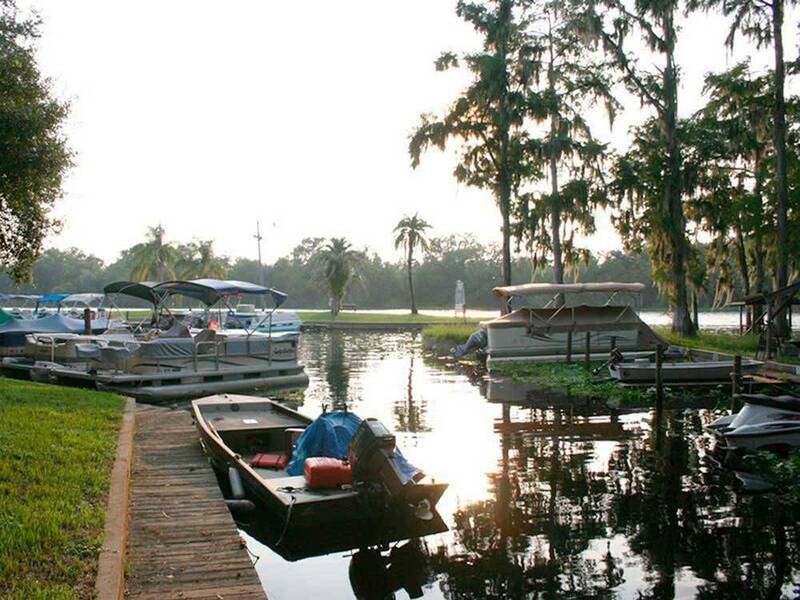 Located on the beautiful shaded banks of the legendary St John River. Out of the traffic but an easy drive to the action of Orlando & the beach cities. 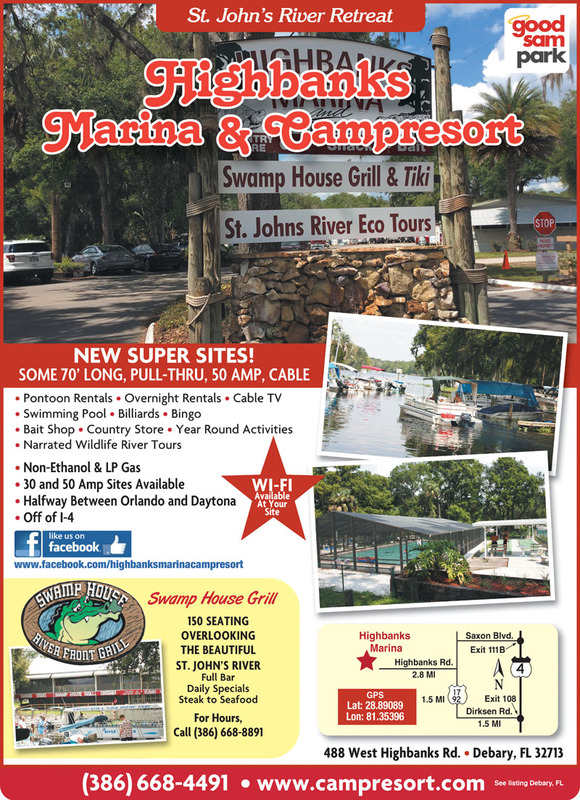 Marina, boat rentals & restaurant onsite. Good Sams ratings are way overated this is strictly a full time retirement camp,they give good sams discount to the ones they want,monthly rates are over priced by $200.00,very noisey with Harley motorcycles all night,i would avoid this park by all cost. Great RV resort for the 55+ crowd. Many seasonal and full time tenants but all sites were kept uncluttered and well maintained. Marina (w/bait and boat rentals), restaurant/full bar, country store and propane onsite. Pool, shuffleboard and horseshoes but no real playground. Everyone very friendly and helpful! Restrooms clean but the one I used only had 2 showers. You have to pay a reasonable fee for wifi but it works very well. Yes, many of the sites are a little tight but mine was great for a 26' trailer. Will definitely come back! Pictures were deceiving and rating (9.5) is a huge question. We stayed for 4 days. We always look for 4 qualifications: Big Rig (40 ft), Pull-Thru, 8 or higher rating, and Dog Park. Pull thru assigned to us was NOT and they claimed to have "Big Rig" capability. Lots were so narrow and small, we barely fit and then adding a car to park became added space needed. Dog park was a small enclosure that many refused to clean up after. I p/u'd after someone once, refused to do it again. Rules stated Pets on leash, but found many just let their dogs off leashes. Lots were not well maintained and any ability to sit outside was not good. Awning nearly reached the camper next to us. People were friendly, but that was about all that was good. We will NOT return. I would give this campground zero stars if it were possible. It would be unfair to say we stayed at this "resort". We made a reservation a couple of weeks before our arrival. It was made clear to the person on the phone that we had a 36' Class A motorhome with 3 slides. Called the day of our arrival to let them know we would be there after 7pm. I was told they would leave our arrival packet on the bulletin board outside the office. Upon arrival, we were to pick an open site. This is where things went wrong. We arrived, found our packet and began to seek out a site. Every site was either too small for our RV or had cars/trucks parked in it from other campers. There was not a single available site that could accommodate us. It would have been nice if the person I spoke to earlier in the day let me know that they really had nothing available to accommodate us before I got the RV from storage, grocery shopped for the weekend and made the hour long drive. So much for a nice kid free weekend with my wife. I will never return and will steer friends away as well. Disappointing.